Stop guessing…find out what’s on your patients’ minds by asking them with Survey Creator. This platform allows you to create a survey and post it in your newsletter in minutes. Ask multiple choice, yes/no, true/false, and fill in the blank questions. Results easily export to Excel where you can analyze the data. Why not ask your best critics to assess how you are doing? 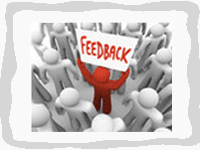 Your patients have first-hand experience and their input is valuable….get it with a survey.